Are you a bit of a push over? Do you allow the people around you to just do as they please? If this is a major theme in your life it will probably show up in your fingerprints. 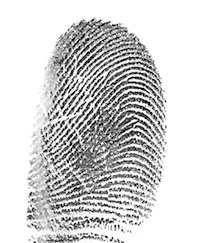 If your least complex fingerprint is on your right index finger (for example, if you have an arch fingerprint on this finger, like the one shown alongside) then this is the theme you’re exploring on a life scale, according to Richard Unger, author of LifePrints, deciphering your life purpose from your fingerprints. This coming Tuesday, April 2nd, we’ll be dive deep into this topic with him in Earth School. On the call Richard will share over 40 years of looking at recurring life issues from the perspective of fingerprints. The focus this coming call will be on right Jupiter issues (right index fingerprint). How this theme shows up but also what you can do about it. Or what advice you can give others if this is their hot topic in Earth School. To find out more about fingerprints and what they say about recurring themes in your life get Richard’s e-book on this topic. or a free report written by me helping you figure out the basics. 1 comment to Are you a bit of a push over?